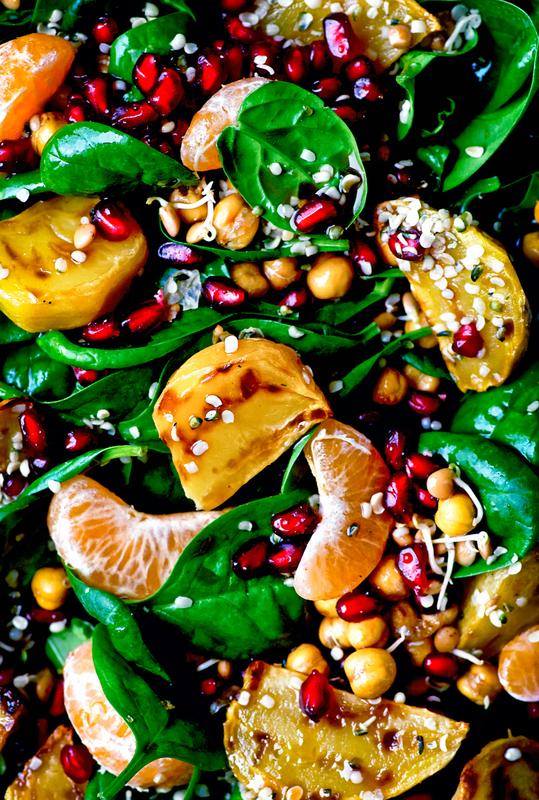 A vegan winter spinach salad with roasted beets, mandarin, pomegranate, and roasted chickpeas. This jewel toned salad is perfect for lunches and a nice way to get some veggies in, even in wintertime. With a balsamic ginger vinaigrette. Do any of you crave salad in the winter? Sometimes I let it slip because I’m missing all the summer salad foods, like tomatoes, but winter salads can be a bit boring if you treat them the same way as hot-weather food. 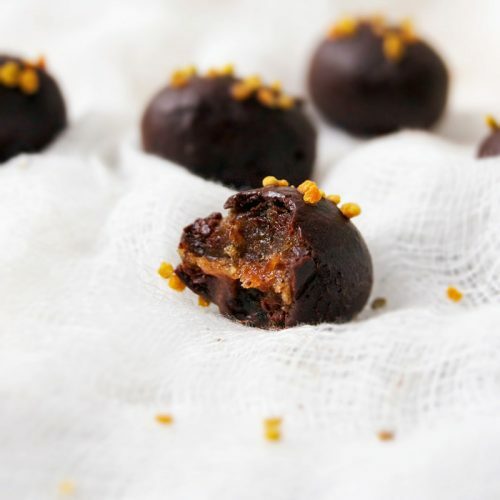 I find we eat so much cooked food during the colder months as we’re relying mostly on root vegetables, that I forget that raw food is important too. I try to do a good mix but when it’s cold out it’s easy to forget and just load up on potatoes (reality). I think it’s fine to have salad or some other type of uncooked green a couple times a week in the winter, unlike every day in the summer. We live in a temperate enough climate that hardier greens like kale, chard, and spinach can be grown outside or in a glass house in the winter, so that’s what I’m using in this recipe, along with a pile of other gorgeous winter produce. My sister is going back to school in January and asked me to work on some recipes that are easy to take to work or school and don’t need to be reheated. I’ve been thinking about it a lot for Graham, too, because he just has a short lunch break and no microwave either. This salad fits the bill and also makes a great side for holiday meals. If you want to add a little more protein for a lunch add some quinoa and you’re not vegan, toss in a hard boiled egg. It doesn’t need it, with roasted chickpeas, hemp, and sprouts already in the salad, but if you have a long day it doesn’t hurt. My mom almost always made a salad with oranges for Christmas and I never liked it. 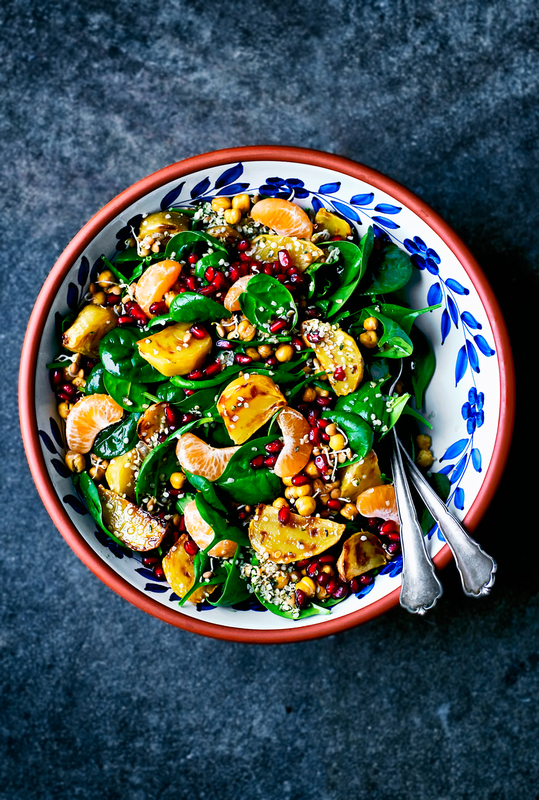 I was a little hesitant to add the mandarin pieces to this winter spinach salad but ended up loving it, so if you’re not sure either, try it! I think maybe what I didn’t like was the weird Asian-ish dressing (sorry, mom, if you read this) because I’ve always been a big orange fan. 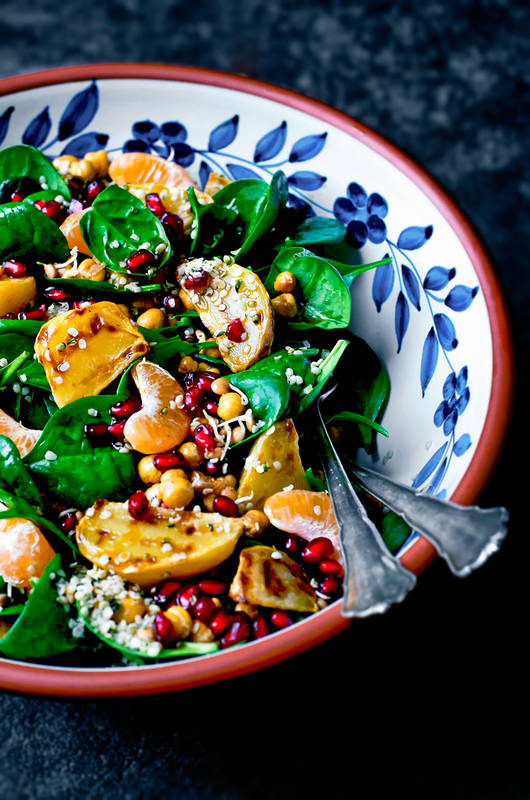 If you’re looking for a pretty, colourful salad to have on your holiday table, you found it! 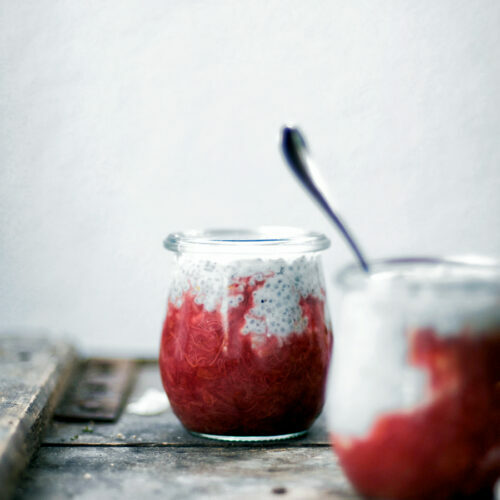 The colours are just perfect for this time of year, especially the little jewels of pomegranate. I used yellow beets but red would be just as nice. A few other possible substitutions – rucola or another winter green, like baby kale or chard, can be used in place of the spinach. 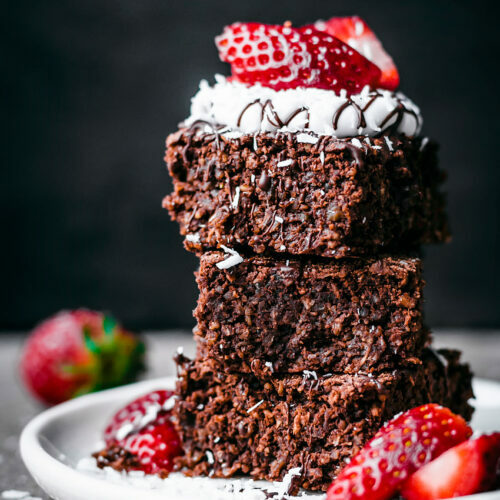 This would be so pretty as a side with my vegan holiday pie for Christmas, but it makes a pretty great winter main salad too. I wouldn’t use lettuce as it will wilt a bit when you add the warm chickpeas and beets, but spinach and other hardier greens hold up well to a little heat. You can switch up the seeds or type of sprouts, but stick with the balsamic dressing. It’s such a nice combination with the beets and oranges. Unlike a regular salad, this will keep in the fridge overnight with the vinaigrette on it if you have leftovers. 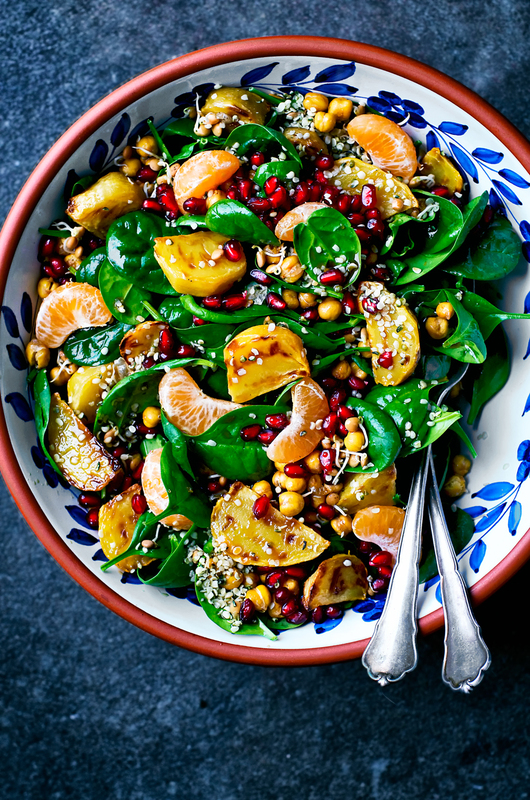 A vegan winter spinach salad with roasted beets, mandarin, pomegranate, and roasted chickpeas. With a balsamic ginger vinaigrette. Preheat the oven to 200C / 400F. Cut the beets into wedges and place onto a baking sheet with the chickpeas, oil, and salt. Use your hands to mix until fully coated, then bake for 30-35 minutes, or until golden. To make the vinaigrette, add all of the ingredients to a jar or container with a tight fitting lid. Shake until combined. To assemble the salad, place the spinach into a large bowl. Add the sprouts, hemp hearts, pomegranate, and oranges, then the roasted beets and chickpeas once they're ready. Top with the dressing and serve warm. Leftovers will keep in the fridge for a day. 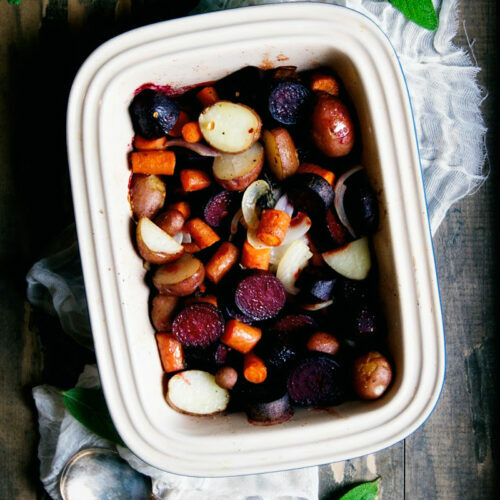 • To make this in advance, assemble the cold ingredients and roast the chickpeas and beets just before serving. You can also make everything ahead of time and serve it cold, I like it that way too. Just add the dressing when you're ready to serve. * Use a microplane for the ginger if you have one.